ANDY HILTON has always been into technology. Trained as an avionics technician in the early 80s, he worked at Atlas Aircraft in Johannesburg where he met Computer Sciences (PTY) Ltd IT technicians. Fascinated by what they could achieve, he swopped aeroplanes for computers and joined Computer Sciences, an American-owned IT company, as a field services engineer, providing support for their clients on everything from main-frames to mini-computer systems. As Hilton points out, it wasn't a huge leap from aircraft electronics to commercial IT systems. 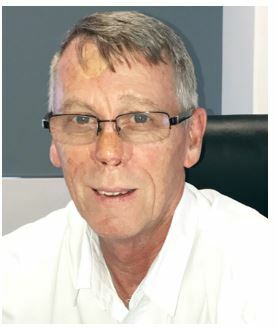 Relocating to Durban, he set up a new branch of the PowerNet Computer Services when Computer Sciences divested in 1986 and quickly built their business in Durban. When the travel bug bit, Hilton used the opportunity to build his career, and spent four years as technical manager for NatWest, responsible for the technical support division for Midlands & Northern UK, before returning to Durban. Outsourced IT was a growing trend, and on his return, he joined international outsourced IT company, EDS, working on clients including the University of KwaZulu-Natal, eThekwini, the South African Sugar Association and Nedbank. This was pivotal move in Hilton's career. Nedbank wanted to set up a new call centre, and outsourced the entire set-up including designing the IT solutions, the build and on-going operations, to EDS. With his banking IT experience, Hilton was the obvious choice for the project and he was in his element. A year later, when NBS wanted to set up their new call centre, they recruited him as call centre technology manager to develop it from scratch. Life has a way of going full circle and when Nedbank acquired NBS, Hilton found himself in familiar territory, tasked with integrating the NBS and Nedbank call centre systems together. Acknowledged as an expert in the group, Hilton was then appointed subject matter expert on call centres for the Old Mutual "Project ROSA", a project to outsource all IT for the entire Old Mutual Group, and one that remains a highlight of his career. In 2007, when Daly Credit Corporation needed a new call centre, Hilton joined the company as IT director. In a field characterised by rapid innovation, Hilton recognised an opportunity to grow the business by offering their IT services as an outsourced resource for the entire call centre industry and, in 2016, proposed a dramatic restructure to the company shareholders. In 2016, SafriCloud became an independent company within the Daly Group, with Daly Credit Company as their first client. SafriCloud has grown rapidly and has an impressive list of clients including Sun International and SA Home Loans. They have also just been contracted by Britam, a major Kenyan insurance company, for Cloud services and support in seven countries throughout Africa. Hilton attributes his success to flexibility, determination and tenacity. His personal philosophy is "Never, ever give up." He also points out that he hasn't achieved his success on his own, he shares it with his team, who he says are ambitious and keen to succeed. His management style is participative, and he believes that company culture is vital in getting the best out of his people. "We don't micromanage," says Hilton, "we want them to buy into the business strategy and share our vision for the company, we treat them well, and we empower them to make the best decisions for the business." He admires Sir Allan Sugar, who built his empire from humble beginnings as a "man with a van" who repaired electronic devices. "Sugar was all about service, service, service. It's that, and the relationships you build with clients that build success in business." SafriCloud continues to innovate at a rapid rate, but new services are introduced with care. Hilton has identified growth opportunities by delivering the same high-tech communications solutions to a wide range of businesses. "Every business needs affordable telecommunications," says Hilton. "We are specialists in low cost telephony for call centres, but we also deliver full service communications in the form of chat messaging services, video calls and conferencing, document sharing - all facilitated in the cloud. This low-cost service can lower barriers to entry for start-ups and help grow the economy, and we are currently developing services for small business and even residential use, working with ISPs to execute this on our behalf." When he's not coming up with new ideas for business, Hilton spends his free time with his wife and youngest daughter who, at 15 years old, has an extensive musical theatre life which he supports with enthusiasm, playing golf or chilling at home with family and friends. Sadly, their three older children no longer live at home. Andy is also a proud grandfather of two.